In our last post, we left off talking about a class C fire extinguisher and why there was nothing to indicate how large an area in which the extinguisher is effective and/or the gallons of water contained within the extinguisher. Whenever you see an extinguisher with a “C” classification, that means the extinguisher can handle fires involving electrical equipment, such as appliances, wiring, circuit breakers and outlets. The material used for a Class C is normally a dry chemical agent, similar to the Class K fire extinguisher we spoke of in a previous post. 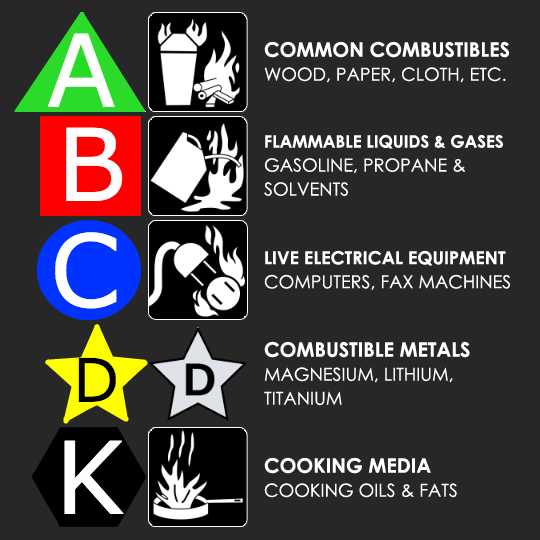 The “C” classification means the extinguishing agent is non-conductive. Never use water on a Class C fire as you run a high risk of being shocked. The next extinguisher we’ll discuss is one that most people will never use, and that’s a Class D fire extinguisher These are commonly found in chemical laboratories or for industrial uses, as a Class D fire is one that involves combustible metals; such as magnesium, titanium, potassium, sodium, etc… These types of extinguishers have no numerical rating, and never have a multi-purpose rating. They are designed for only class D fires! “S” for Sweep the extinguisher nozzle from side to side while aiming at the base of the fire. A little prevention and preparedness on your part are still the best line of defense against a devastating house fire. Stack the odds in your favor by always watching what you’re cooking, be prepared with a lid and some baking soda and if necessary, be sure to have the proper fire extinguishers in your home for any possible fire. As always, should you or someone you know suffer a house or building fire, please contact Phoenix Restoration & Environmental Services right away, at 570-269-5029. Phoenix is proud to service the northeast Pennsylvania region; from the Poconos, Slate Belt and Lehigh Valley areas. CALL TODAY @ 570-269-5029, for any fire, smoke, mold and water remediation, removal and restoration needs. We treat your home, as our own.